If you are an international student in the United States, you may know how difficult it can be to not speak any English while in a predominantly English speaking country. Even if English is your first language, you may have a better idea of the struggles non-English speakers face than do most Americans living in the US. Considering this, you might consider studying teaching English to speakers of other languages (TESOL). Why Study Teaching English to Speakers of Other Languages? English is the second most widely spoken language in the world, and it becoming increasingly associated with academic, profession, and social success. For this reason, more and more people desire to learn English, and there is a growing need for people willing/able to teach them. Many colleges and universities offer graduate and undergraduate programs in teaching English to speakers of other languages. These programs will prepare you to teach the speaking, writing, and reading of English to people whose first language is not English. If you choose to teach English to speakers of other languages, you will have the opportunity to spend time in schools, both observing and teaching. You might consider volunteering as a coach, tutor, or camp counselor for English language learners. This will provide you with real world experience, which will be valuable in helping you to find a job following your graduation. You might also consider studying a language other than English, although you do not have to become fluent. You can learn more about teaching English to speakers of other languages by visiting the TESOL website. Is this program accredited by the National Council for Accreditation of Teacher Education? Is this program approved by the state’s Department of Education? Does this program focus more on practice or theory? If you are hoping to go straight into teaching, you probably want to look for a more practice-oriented program. What do current students and recent graduates of the program have to say about their experiences? 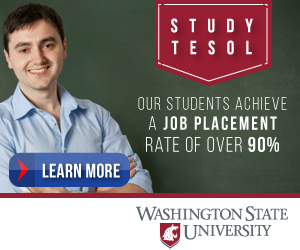 What percentage of graduates gets TESOL jobs after graduation? Will the program help me find work after graduation? It's also important to consider what credentials you need when it comes to teaching English. Whether your career keeps you local or overseas, these requirements can vary dramatically. Some programs require that you have an MA in TESOL while others may be happy with a certificate. Many schools consider this and offer both versions. The New School, for example, does just that and offers both a certificate and the Masters degree so that no matter the qualifications you need, you'll be ready! Adult educators teach English to adults in places such as community colleges, adult high schools, university extension programs, and prisons. Elementary, middle, and high school teachers teach English to students at public and private schools. Translators read written materials ranging from poetry to technical manuals in one language and copy them down in another. Interpreters foster communication between individuals or groups by orally translating from one language to another. Interpreters might work in any number of places, including courtrooms and boardrooms. Some students who study teaching English to speakers of other languages might choose to go abroad and teach English in foreign countries—or, in the case of international students—in their home countries. Visit the Study in the USA School search to find schools that offer programs of study in TESOL. Over time we will be updating this section and including more information for those who want to study tesol in the USA and for other countries, but please feel free to post your thoughts and comments on our Facebook fan page, and also follow us and post questions through Twitter.